Tired of waiting in long lines at the airport, just to have your flight delayed? Troubled by the constantly rising price of a plane ticket? Sick of security invading your privacy? Introducing Jump Gunners, a revolutionary new product that will change how you travel. Just grab any gun, aim at the ground and tell it to eat lead. It’s that easy! Now you’re soaring through the sky like it was nothing, for only the price of ammo. Planes are crowded, expensive and inconvenient; with Jump Gunners, you can fly where you want, when you want, for only the price of ammunition. Artillery-based air travel will never be the same; take that, rocket jumpers! Disclaimer: Do not try this at home. Guns cannot be used to propel a human in controlled flight. Attempting to fly with weaponry will result in injury and public humiliation. This is a parody advertisement based on the competitive shooter Jump Gunners. Do not try it at home either, as it will result in similar adverse effects. 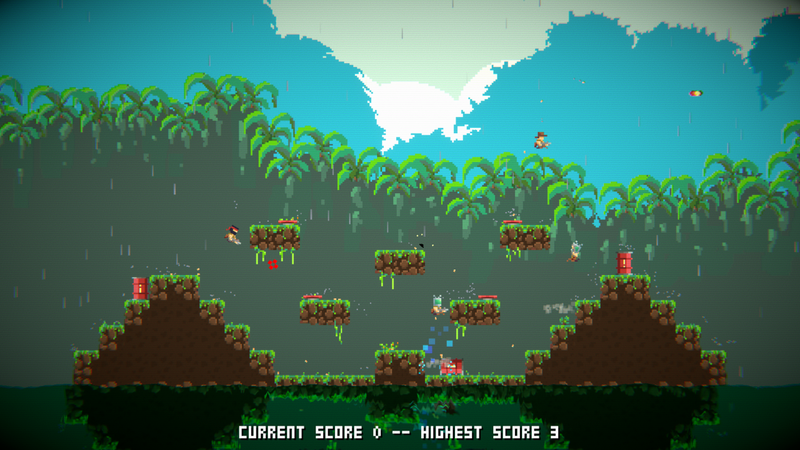 Gun jumping (duh) – The game’s title mechanic is naturally its best asset. Using a twin-stick shooter setup, every weapon has severe kickback and will launch you in the opposite direction of where you’re aiming. Firing straight ahead will ruin your footing; firing down will lift your feet off the ground. You can take to the skies by repeatedly shooting at the ground, steering by making micro-adjustments to your aim. It’s easy to grasp and feels great, extremely reminiscent of No Time To Explain and its propulsion via giant laser. Fighting opponents is where the mechanic truly shines. With every shot, you need to consider where that recoil is going to send you. Are you going to spin around and take out someone, risking being propelled backward into a spike pit, or be more cautious and stay in controlled flight? It’s a simple yet satisfying risk-reward system, and with over 20 weapons with various levels of kickback, the art of recoil-based flight will take a while to properly master. Variety – Like any good multiplayer-centric game, there’s a ton of different ways to kill your friends. The standard mode is a free-for-all deathmatch, taking place on a series of randomly selected maps pulled from a well of over 80 arenas diverse in both aesthetics and physical layout. Every round is a quick one-hit kill affair, where the lone survivor (if there is one) gets a tally on the scoreboard. Whoever reaches the designated number of points first wins. There’s also team deathmatch and capture the flag, which follows the same basic structure. My favorite is the horde mode, the game’s only co-op mode where players work together to take out randomly-spawning AI. There’s even a Duck Hunt ripoff, which is an obvious gaffe but cool nonetheless. All modes are 2-4 players via local co-op, and the deathmatch modes can be padded with AI bots to make a full party. Needs more jumps – There’s already hundreds of competitive indie party games, and this doesn’t do enough to stand out from that crowd. The jump-gunning mechanics aren’t wholly necessary, and I’ve had many a match end without anyone even making an attempt to use them. This is mostly due to the one rule that can’t be changed, single hit kills. Smaller maps and some big ones with poorly placed spawns boil a match down into a lame who-shoots-first affair that ends before it starts. Other maps just have an unnecessary number of insta-kill hazards, so much so even highest difficulty bots have trouble not immediately falling off a cliff. Horde mode was my favorite to play because it was the only one that really benefited from jump gunning, and deaths happened a lot less frequently. 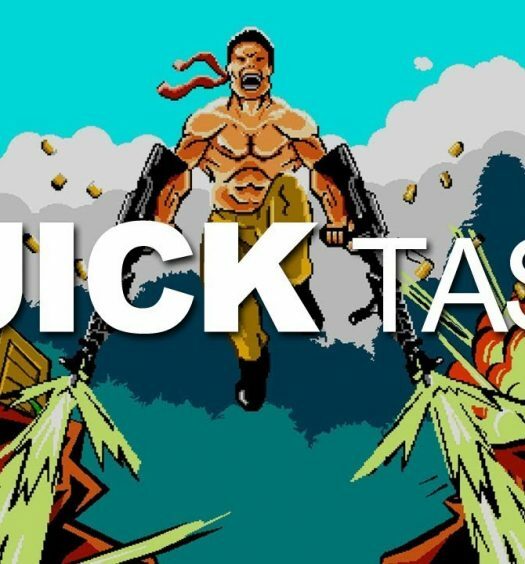 Without much opportunity to use its defining feature all you got left is a standard run-and-gun twin-stick shooter and not a great one at that. Firing weapons feels great thanks to the game’s focus on recoil, but basic movement is too slippery and imprecise. Miner complaint – The game touts completely destructible environments, but it’s only true on a technicality. All ground blocks in any mode can be broken, but more often than not there’s indestructible metal hidden underneath to retain the structure of a level. Tunneling through the ground is less “valid guerrilla tactic” and more “blind gamble”. Since matches are often over in a flash, showing the metal bits outright takes away the guesswork so you can focus on a surefire plan of attack. Chip tunes – Much like its gameplay, the art direction is also a bland rehash. The marketplace is currently oversaturated with 8-bit throwbacks, and this game just blends in with the crowd. While incredibly bland the visuals are mostly inoffensive; it’s the audio that’s the real problem. It takes all those loud, static-y noises common during the early years of gaming and… that’s it. From gunshots to jumping, every action is punctuated with a sound that’s basically the obnoxious royalty-free version of what an 8-bit game would sound like. I can’t blame the developers for wanting to be authentic, but sounding good should have been a higher priority. 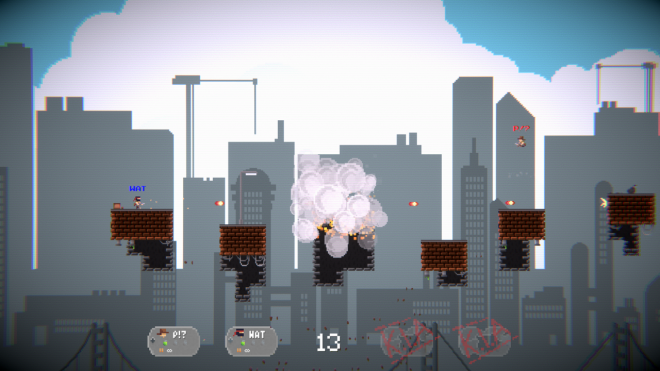 Single player – The game features a series of single-player challenges, which are small levels where you must shoot all targets to win. You’re graded on three criteria, each one worth a star: time, not dying and ammo usage. It’s that last one that ruins the whole thing, as a level’s par is usually equal to the number of targets you need to shoot. You’re actively encouraged NOT to use the game’s namesake feature because it’s an immediate waste of bullets. Challenges are basically designed like standard platforming fare, going so far as to actively design some challenges to prevent you from cheating it with gun-jumping. 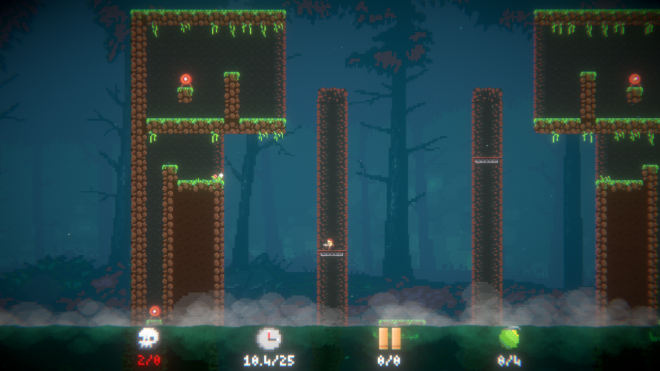 The platforming also gets pretty difficult, which the controls are just too floaty to support. Single player modes in multiplayer games are rarely the highlight, but I’ve never seen one as horribly backward as this. Jump Gunners has a strong main concept, but the game does so poorly at highlighting it that it merely feels like optional bells and whistles. That leaves us with a basic core of a competitive sidescrolling shooter, and while it works, it doesn’t have a high level of polish. It’s a mediocre party game you’ve seen a million times before; while it has enough mayhem to be fun with a few friends, it’s not going to leave a lasting impression on anyone. 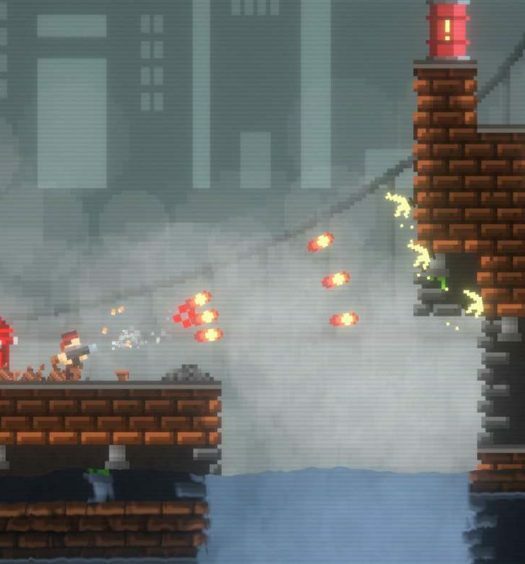 Jump Gunners was developed and published on Xbox One by NerdRage Studios. It was released August 3, 2018 for $12.99. A copy was provided for review purposes.